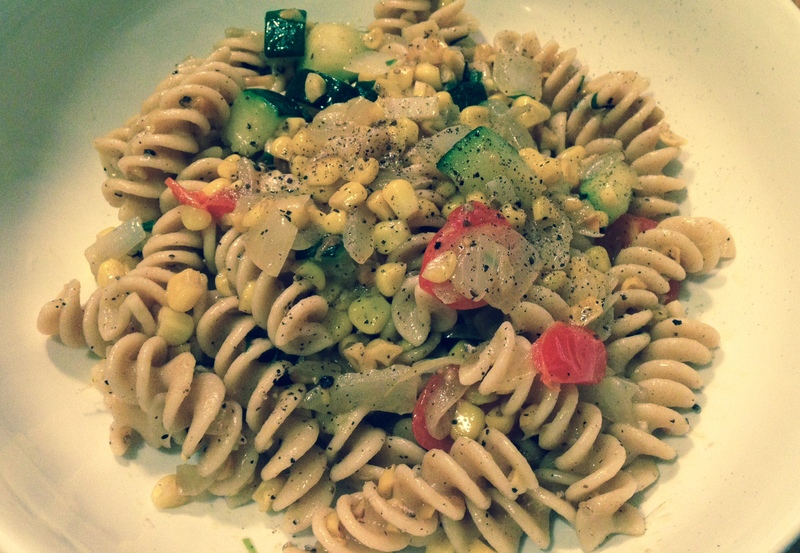 This simple vegetarian pasta recipe by Mark Bittman was surprisingly delicious. I’ll definitely be making this one again and again. You’ll need: 4-5 cups cooked whole wheat fusilli pasta, corn kernels from 3 ears of corn, 2 cups of diced zucchini, 1 medium onion chopped, 4 cloves of garlic minced, 2 tablespoons of chopped fresh tarragon leaves, one handful of cherry tomatoes halved, 4 tablespoons extra virgin olive oil, generous pinches of sea salt and freshly ground black pepper, a really large frying pan or large dutch oven, and 30 minutes. Cook the whole wheat pasta in really salty water, reserving some of the pasta water for the end. Heat your pan, add 2 T of EVOO and cook the corn for 5 minutes til slightly brown. Add the diced zucchini and push it down so it touches the bottom of the pan, cook for another 5 minutes. Add 2-3 pinches of salt and pepper, onions and garlic. Stir and cook for another 5 minutes. Add the tarragon leaves and tomatoes, stir and cook for 5 more minutes. Turn the heat off. Add the pasta along with 1-2 tablespoons of olive oil, stir well. The pasta should be glistening with olive oil, season again generously, each fusilli should be speckled with freshly ground pepper. You can add a spoonful of pasta water if it all looks too dry at the end. This is supremely yummy and healthy too. Enjoy!